From southbound Division (which curves into Browne), drive through downtown Spokane and up the hill toward Sacred Heart Medical Center. After the road loops around the hospital, veer right onto the arterial up the Grand Boulevard hill (FYI: the 20 mph speed limit through Manito Park is enforced). From Grand, turn left at the light on 29th. Proceed 1.3 miles to the light at Southeast Blvd. and turn right. Continue a half mile to the light at Regal Street and turn right again. Proceed a half mile to the Regal Center, located on the right side of the street at 4202 S. Regal. From northbound U.S. 195, turn right on Hatch Road, immediately following Mile Post 91. Proceed a mile up the hill to the stop sign at 57th. Turn right on 57th and drive approximately one mile to the light at Regal. 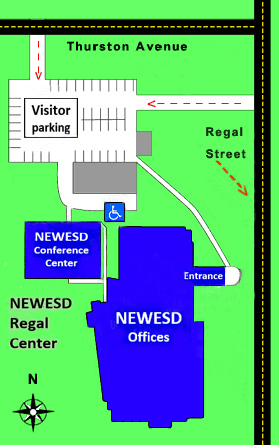 Turn left on Regal and proceed one mile to the Regal Center, located on the left side of the street at 4202. S. Regal. From westbound Interstate 90, take the Thor-Freya exchange (exit 283B). From the off-ramp, continue straight one block to the stop light at Thor. Turn left on Thor and proceed up the hill 2.3 miles until the road dead-ends at 37th (Ferris High School). Turn right on 37th. Continue two blocks to the light at Regal and turn left. Proceed four blocks to the Regal Center, located on the right side of the street at 4202 S. Regal. From eastbound Interstate 90, take the Thor-Freya exchange (exit 283B). From the off-ramp, continue forward to the stop light at Thor. Turn right on Thor and proceed up the hill 2.3 miles until the road dead-ends at 37th (Ferris High School). Turn right on 37th. Continue two blocks to the light at Regal and turn left. Proceed four blocks to the Regal Center, located on the right side of the street at 4202 S. Regal. More than 40 restaurants, grocery stores, coffee shops and delis are located on or near the Regal Street corridor, within approximately one mile of NEWESD 101. Click here for an enlarged version of the local restaurant map.